Over recent decades few topics of American history have been subject to greater attention and more thorough revision than African Americans in colonial times. Acclaimed works by leading scholars, relying on new bodies of evidence and writing from a fresh, Atlantic perspective, have provided a broadened, more nuanced view of the topic. 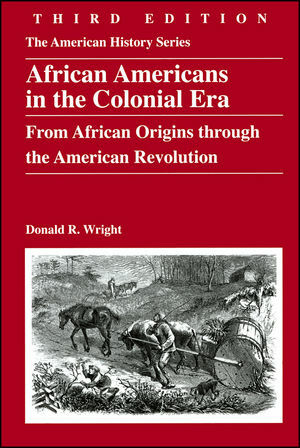 In this third edition of one of the most popular books in our American History Series, Donald Wright works new interpretations into a narrative that provides a clear understanding of the scope and nature of the early African-American experience. Included are discussions of African Americans’ African origins; the Atlantic slave trade, based on the latest data from an on-line Trans-Atlantic Slave Trade Database; the origins of slavery and race-based prejudice in the mainland colonies; the evolutionary formation of African-American culture; and the effects of the American Revolution on men and women of African descent, at the time and long thereafter. This third edition views African Americans in the British North-American mainland colonies more as their contemporaries did: as persons from one of the four continents who interacted economically, socially, and politically over a period of 180 years in a vast, vibrant, complex Atlantic world. It shows how the mainland North-American society that resulted from these interactions reflected the mix of Atlantic cultures and how the republic that a group of these people eventually constructed used European ideas to support creation of a favorable situation for those in control, persons largely of European descent. The African and African-American men and women, whose forebears had added greatly to the region’s economic and cultural viability, found themselves in 1789 with the least benefit from the nation they helped bring into existence. Donald R. Wright is Distinguished Teaching Professor of History, Emeritus, at SUNY-Cortland. He is the author of African American in the Early Republic, 1789—1831 (1993) in the American History Series and The World and a Very Small Place in Africa: A History of Globalization in Niumi, The Gambia, 3rd ed. (2010), and co-author of The Atlantic World: A History (2007). His degrees are from DePauw University and Indiana University. He has received fellowships from Fullbright-Hays and the National Endowment for the Humanities, and in 2003 he was Scholar-in-Residence at the Rockefeller Study Center in Bellagio, Italy. He lives in Homer, New York.